Devoted Park Slope Food Co-op member Jonah Burke designed an app for members and anyone looking to learn more about the co-op and local food. PARK SLOPE — A devoted Park Slope Food Co-op member has designed a free app that makes it easier for foodies to learn about their grub's farm-to-shelf journey, keep tabs on their monthly work shift duties and track the arrival of items ranging from arugula and garlic scape pesto. 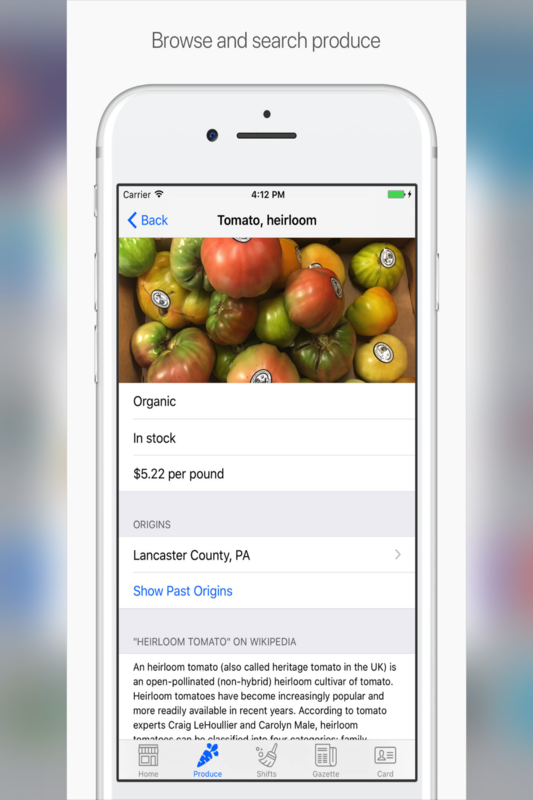 More than 300 in-stock fruit, vegetable and herbs are cataloged in the app's library along with the ability to scan co-op cards into Apple Wallet and log monthly shifts that all co-op members must work, which are notoriously difficult to swap. But you don't have to be a co-op member to use it and folks interested in exploring local produce and what's available at nearby farms might want to sink their teeth into the digital resource, said the programmer behind the app. 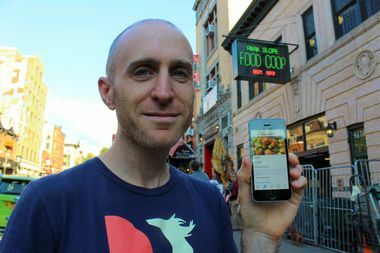 "I think anyone who cares about healthy food or local food and farms will be interested," said Park Slope resident Jonah Burke, who has been a co-op member for nine years and independently embarked on building the app. "Produce is the main focus. Everyday it will send you a notification of what's new, which is fun if you're into food and helps you come up with ideas about what to make." The app's homepage logs new arrivals such as Friday's gold raspberries from Lancaster, Pennsylvania, or garlic scape pesto from Middletown, New York, taken from information publicly published on the co-op's website. Users can browse the library for a taste of where the produce is coming from and the cost, such as rainbow carrots from Hepworth Farms for $2.17 a bunch, arugula from Gotham Greens for $3.59 and cherry tomatoes from Grindstone Farm for $3.34. Most items come with a brief overview of what they are and a link to more info, which can come in handy for some of the co-op's items that your average shopper might not be familiar with such as the agretti vegetable, which was once reduced to ash for making glass and is now sought after as a gourmet ingredient. App users can also dig into the co-op's history with an archive of the market's newspapers, The Linewaiter's Gazette, back to 1999 — great for those interested in learning more about the Union Street store, keeping up to date on recent happenings including management of the pension fund or for those who've flown the coop to other areas and want to keep tabs on the institution. "The newsletter comes out with all sorts of wacky stuff," said Burke, who spent four months making the app that is available for Apple devices. "It's a weird, great place and this lets you explore its historical weirdness." The co-op itself has not yet authorized the app for the more than 17,000 members to use since the co-op staff hasn't yet had a chance to come together and review it. Designed and maintained purely out of love for the co-op and fresh food, Burke hopes it helps others get the most out of the institution. "I like to know where my food comes from and for this project I thought, 'Here is an intersection of something I love and that is important,'" said Burke. "It comes just out of the desire for better food."